Nothing quite prepared us for this. After remarkable Swiss-Standard green countryside coming into Russia out of Mongolia, we left Novoborisk this morning and pounded down 600 kms of dead flat, virtually straight roads, raised up over flat Norfolk-like terrain, with the odd clump of birch trees on either side. Nothing changes, and we are told we have to “get used to the monotony.” What a contrast compared with Mongolia only a few days ago. We stopped at truckers cafés for time-controls, snacks and coffees, before pushing on for Omsk. Prince Borghese and his rivals came here in 1907, and entering the town you wonder if little has changed, with old shacks and wooden chalets of a distinctive Russian architecture. Not much to report then, except that we have torn out yet another page from the Route Book. The morning start was not after a good breakfast at 8.0am, and officially 109 rallycars clocked out of the start control, but, at least five had skipped this procedure and were already on the road, eager for an early start to get going again after a day’s relaxation, collecting a bucket load of penalties for the jump-start. We passed the Pullen’s little Rover 12, running in close company with the Delage of Harold McNair and Anne Thomson, the Ayre’s Itala, sounding perfectly healthy, and the Wilson’s in their yellow Rolls Royce. At a coffee stop we noticed Richard Newman’s Chryler Special and Arthur Freeman’s Ford re-fuelling, the roads are bumpy, rippled with the odd pothole but most are able to romp this stuff with ease, car 35, the Alvis Speed 20 of Horst Friedrichs and Gerhard Lux made light work of today’s mega-long haul and were among the first to reach the hotel near the river here, at one point cruising at 140 kph – being Sunday traffic was light and there was only the odd truck, otherwise we had all this road to ourselves. 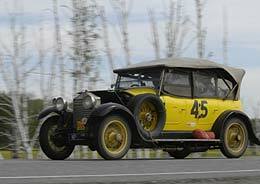 The Talbot of Daniel Ward was the first Pioneer to reach Omsk, reckoning he completed the 600 kms in under 12 hours. The car continues to run like clockwork, having had the front axle straightened out in a giant cold-press discovered in a Russian Locomotive Museum which had enormous old steam engines that look like something loaned to the Dr. Zhivago film-set on its front lawn. We have been joined by Car 6 – readers with good memories will recall the shattering disappointment of the seven-litre Knock Type R, which retired in China when the crankcase split open, well, the good news is that the Michael Laarman and Antonius Poelsma who patched things up after trucking back to Peking have played a mighty job of playing catch-up and are now running with us, although the engine is now on three cylinders. The long, low red Pioneer chugs along, sounding just like a Sopwith Camel on take-off. The first casualty today concerned the Frost’s Chevrolet, which was sidelined with broken steering, and a truck was rapidly organised by local police. We said goodbye today to the Dunkley’s, who have retired with engine troubles, suspecting a duff big-end bearing, in what is probably the most travelled Derby Bentley in captivity – the car that has completed the 1997 Peking Paris, the Around the World in 80 Days seven years ago as well as Monte Carlo Challenges and a Classic Safari…the old girl has cried enough to all of this, and the couple are now on their way home. One Bentley crew have put in an extraordinary effort in catching us up…Jean Pierre Muller and William Medcalf in a Bentley 4.5 have driven 36 hours non stop after a broken back axle and much else, damage caused simply by too much haste over the rough stuff of Mongolia. What an effort! Shock Horror! The Lancia Special of Jan Voboril has been kicked out of the General Classification by Clerk of the Course Kim Bannister – so, he is no longer third, although the driver reckons that if sheer determination counts for anything he ought to be at least first-overall. The reasoning is simple: The Regulations say a crew of two has to compete, and, now that the general standings have been reviewed, and, the fact that nothing seems to deter this car or force it into retirement, the facts of the matter are that he can’t be classified. It makes no difference to the driver – he intends to continue onwards, and reckons he will not only complete the entire course single-handed, he wants to do it as the only car in the entry-list without the official service-crews putting so much as a screw-driver on his car. So officially he is not competing, (but your correspondent will be keeping you up to date on this heroic effort). The driver (see photo) says when he gets to Paris, he is going to buy his own trophy - and then present it to FIVA. Gossip Column: We hear wild rumours that the crew of Car 2, the three-litre Itala of Jonathan Turner and Adam Hartley, are on the Trans-Siberian Express, and hope to re-join their car (which is on a truck) somewhere later on in Russia…we got this gossip from David Hall, who is running well in the open Chrysler Special that completed the 1997 Peking-Paris in the hands of Bill Ainscough. Interestingly, we picked up David’s travel bag before it was stowed away and we reckon the Hall’s are travelling considerably lighter than anyone else on the entire event… (well, except “Biggles and Ginger” in the tiny Singer Nine). So, 109 set out today – remarkable – but the true picture is that rather more are either on the road early, or, playing catch up…and at this stage in the game this statistic on its own is a quite remarkable under-scoring of Peking-Paris determination, and sheer human endeavour.